If you are interested in the effective and realistic use of the combative methods recorded within kata, it is important that you have some understanding of their history. Without an understanding of this history, you will be unable to appreciate kata in the correct context. You will therefore have little chance of unlocking the methods they contain. Kata has always been an integral part of karate practice. To understand the history and development of kata, it is vital to look at the history and development of karate as a whole. The recording of information through physical movement is an ancient practise. Even today, many cultures use 'dances' and sequences of physical movements to tell stories and to pass on their cultural heritage to the next generation. There can be little doubt that groups would also wish to pass on the fighting and hunting techniques they had refined and found to be most successful. When an individual learned the fighting and hunting skills of the group, they would be asked to copy the movements of those who were more experienced. The elders would demonstrate the various movements, and the younger members of the group would try to emulate these movements. These skills would eventually be further refined and then passed onto subsequent generations. It is in this way that the first "kata" will have been created. It was upon the island of Okinawa that the system of fighting that came to be known as karate was developed. Okinawa is one of a chain of islands that are collectively known as the Ryukyu Islands. Okinawa lies five hundred and fifty miles east of mainland China, approximately halfway between China and Japan. During the 11th century, a number of Japanese warriors that were fleeing from the Taira-Minamoto wars made their way to Okinawa. Many of the Minamoto samurai remained upon the island for the rest of their days. The bujitsu of the Minamoto samurai will have had a large influence upon the fighting methods employed by the Okinawan nobles. It is believed by some that one part of Minamoto bujitsu that had an influence upon the development of Okinawan fighting methods was the idea that all motion is essentially the same. Whether striking, grappling or wielding a weapon, it is said that the Minamoto samurai taught that all fighting techniques relied upon similar physical movements. An individual would be taught a particular physical movement, and would then be shown how that movement could be adapted to achieve varying results. The results of this combat philosophy can perhaps still be seen in modern day karate as it is not uncommon to see a single movement in a kata being given several effective applications. By affording a movement multiple applications, great amounts of information could be contained in a kata of a manageable length. The use of multiple applications also helps ensure a quick response in combat. The reason being that the practitioner has not learned many different movements for many different situations - which is extremely undesirable as the brain will have to shift through large amounts of information before being able to determine the appropriate movement - but will instead have learnt a relatively small number of movements that can be applied to many situations. In 1377, the king of Okinawa expressed his allegiance to the emperor of China, which resulted in a huge influx of Chinese culture and customs. Chinese fighting systems and ideas were included in this cultural exchange. The methods of the skilled Chinese martial artists had a huge influence on the growth and development of the native Okinawan fighting systems. These Chinese martial artists also transported many of the kata practised within modern karate to Okinawa, and their methods were the inspiration behind many others. Indeed, many of the kata are named after the Chinese martial artists who created or inspired them e.g. Kushanku, Wanshu, Chinto etc. In 1429, King Sho Hashi wished to improve the standing of Okinawa and as a result the Okinawan people increased their trade with other countries. This resulted in increased trade with Indonesia, South-East Asia, Korea, Japan and China. The towns of Shuri and Naha became famous as trading centres for luxury goods. Later these towns would also gain notoriety for the systems of fighting that bore their names. This increase in trade will also have led to more people visiting Okinawa; and in all probability a further increase in the exchange of combative ideas. This will have further influenced the native fighting systems, and the kata used to record those systems. In 1477, Sho Shin (the king of Okinawa) imposed a ban on the private ownership of weapons by civilians. This attempt to control the population of Okinawa had a huge effect on the nature of the native fighting skills. In the majority of fighting systems throughout the world, weapons were always the first choice. No warrior would choose to fight with their bare hands when they could use a weapon. The banning of weapons resulted in the Okinawan people having no other option but to use their unarmed combat skills in the event of attack. This acted as a catalyst in the advancement of the empty handed fighting skills of Okinawa. At this time, all the Okinawan nobles were required to live close to Shuri castle. The moving of the nobles close to Shuri castle also had an effect on the development of karate. It was common practise throughout the world for kings to keep nobles close at hand. This made the organising of meetings a great deal easier and ensured that the families of the various nobles were within hostage-taking distance. This would ensure loyalty to the king and could be used as a strong negotiating tool in the event of any disagreements. As was common place throughout the rest of the world, the Okinawan nobles would also be granted favours and social status for their loyalty and service. Many of the nobles would therefore practise martial arts to ensure that they had the skills needed to maintain order and to protect the king should the need arise (just like the knights of England). Strong fighting skills would be acknowledged and rewarded by the king. It was the upper classes of Okinawa that were predominately responsible for the cultivation and development of karate, and not, as is commonly thought, the lower classes. The upper classes of Okinawa had the resources, time and opportunity to actively seek out instruction in the martial arts. In 1609, Japan was ruled by the Tokugawa shogunate, which maintained power through the skilful playing off of one group against another. The Tokugawa clan had previously defeated the Satsuma clan, but they still considered them to be a threat, and hence they were sent to invade Okinawa. This would ensure that the Satsuma samurai were out of the way and it also resulted in the punishment of the Okinawans for failing to supply Japan with supplies it required for a previous attack on China. The invasion was successful and once again the Okinawans were prohibited from possessing weapons. Any Okinawan found in possession of a weapon would be severely punished. To defend themselves, the Okinawans again had no option but to rely upon their empty-handed fighting skills, in addition to the combative use of domestic and fishing tools. Various laws were imposed by the Japanese to eradicate all traces of the Okinawan fighting systems. This resulted in karate being practised in secret. This had a profound effect upon karate and it became a system that was only meant to be understood by a chosen few. The kata and, in particular, their applications became further shrouded in secrecy. A kata and its combative applications would only be revealed to the most trusted student. The effects of this are still felt today as many of the meanings of kata movements have gone to the grave with the kata's early practitioners. The Satsuma clan maintained control over Okinawa for nearly three centuries until Okinawa officially became part of Japan. The system of fighting employed by the Satsuma samurai was Jigen-Ryu Bujitsu. Some of the Okinawan nobles were eventually instructed in this system. Indeed, Bushi Matsumura - a karate master who was employed by the king of Okinawa as a bodyguard - gained his teaching certificate in Jigen-Ryu. There can be little doubt the some aspects of Jigen-Ryu Bujitsu will also have had an effect upon what became known as the Shuri-te style of karate. From what we have seen so far, we can conclude that karate is a synthesis of many different fighting systems. Okinawa's unique position in the world and the various bans on weaponry made it the ideal place for a highly effective system of empty hand combat to develop. Over many centuries, the Okinawans had the opportunity to study a significant amount of differing combative traditions, and hence take the most effective techniques and concepts from each to form a very efficient system. Not only did the Okinawans have the means, but they also had the motivation. Whilst in other cultures the development of effective empty hand skills would take second place to the development of weapon skills, the Okinawans were not afforded the same degree of luxury. It is also important to understand that the Okinawan fighting systems were closely guarded secrets. Many of the kata practised at this time were Chinese in origin, but they would have been influenced by the techniques and concepts gleaned from fighting traditions originating from other parts of the world. The Okinawans also developed their own kata to record their fighting systems. The only purpose behind a kata at this point in history was to record highly effective and brutal methods of combat, and to provide a training method to help perfect those methods. But things were soon to change. As modern karate practitioners, who desire effective combat skills, we need to be aware of these changes. In 1868, Japan moved from feudalism to democracy. During this time the Japanese abandoned many of the aspects of their culture that were attached to feudalism. The class structure, the wearing of swords by samurai, the styling of the hair in to the "top-knot" etc were all to be abolished. However, the Japanese authorities were keen to continue to foster many of the values associated with the past. It was felt that the practise of martial arts would promote health, would develop strong sprit and encourage morality in the Japanese people. It was also felt that martial practice would help the Japanese to maintain a sense of national identity in the wake of political change and foreign influence. The development of "sporting" martial arts, that were thought to continue the values associated with bushido, was supported by the ministry of education and hence arts such as Judo and Kendo were strongly promoted in Japan's education system. It was also felt that the healthy bodies and strong spirits developed through the practise of Budo would be an aid to Japan's growing army. In 1891, during their medical for recruitment into the army, the exceptional physical condition of some karate exponents was noted. As a result, the military enquired as to whether karate could be of use to the Japanese army, as Judo and Kendo had been. This idea was ultimately abandoned due to the disorganisation of the karate fraternity, the length of time it took to become competent and due to fears that the Japanese troops may use their new found skills in brawls. At the turn of the twentieth century a group of karate practitioners campaigned to get karate placed onto the Okinawan school system's curriculum in the belief that karate practise would promote healthy bodies, improve character and would result in students who were more productive in Japanese society. In 1901, Anko Itosu campaigned successfully to get karate onto the physical education program of an Okinawan elementary school. As it stood, Itosu believed karate to be too dangerous to be taught to children and set about disguising the more dangerous techniques. As a result of these modifications, the children were taught the kata as mostly blocking and punching. It is also said that Itosu also changed many of the more dangerous strikes (taisho, nukite etc.) into punches with the clenched fist. This enabled the children to gain such benefits as improved health and discipline from their karate practice, without giving them knowledge of the highly effective and dangerous fighting techniques that the kata contain. Itosu was eventually appointed as karate teacher to an Okinawan collage, and a few years later he wrote a letter to the education department that outlined his views on karate. In this letter, he asked that karate be introduced onto the curriculum of all Okinawan schools. Itosu was granted his wish and karate became part of the education of all Okinawan children. Itosu's modifications resulted in huge changes in the way the art was taught. The emphasis was now placed firmly upon the development of physical fitness through the group practice of kata. The children would receive no instruction in the combative applications associated with the kata and deliberately misleading labels were adopted for the various techniques. Today, it is Itosu's terminology that is most commonly used throughout the world and it is important to understand why this terminology developed. When studying the combative applications of the kata, you must remember that many of the names given to the various movements have no link with the movement's fighting application. Terms such as "Rising-block" or "Outer-block" stem from the watered down karate taught to Okinawan school children, not the highly potent fighting art taught to the adults. When studying bunkai be sure that the label does not mislead you. Itosu's changes also resulted in the teaching of kata without its applications. The traditional practice had been to learn the kata, and then when it was of a sufficient standard (and the student had gained the master's trust) the applications would then be taught alongside the kata. However, it now became the norm to teach the kata for its own sake and the applications may never be taught (as is sadly still the case in the majority of karate schools today). Itosu is often criticised for "blunting" karate due to the changes he instigated, but I feel this is grossly unfair. At that time, karate was essentially a dying art and had Itosu not ensured that it adopted the modern characteristics - as already taken onboard by Judo and Kendo - karate may well have died out. Itosu will have had no idea that his "children's karate" was due to become the world's most popular martial art, and hence will not have known what a profound effect his changes (and the changes of those who followed him) were to have. The majority of today's karate practitioners practice the art in the "children's way" and not as the effective combat art it was originally intended to be. Indeed Itosu himself encouraged us to be aware of this difference. Itosu once wrote, "You must decide whether your kata is for health or for its practical use." In the mid 1930's, Gichin Funakoshi - a student of Itosu and the founder of Shotokan karate - led a movement to gain karate national recognition from Japan's leading martial arts association. After numerous meetings and demonstrations, karate was finally granted national recognition, but there were a number of conditions attached. The Japanese insisted that karate develop a unified teaching curriculum, distance itself from its Chinese origins, adopt a standard training uniform (a lightweight Judo gi was decided upon), assign a system of ranking (the Kyu-Dan grade system of judo), develop a system of competition and to further reduce some of the more violent methods employed. Funakoshi and his group were successful in these tasks and karate gained national recognition and hence continued to spread. These changes were vital if karate was to continue to grow, but again they had a negative effect on the combative aspect of the karate kata. 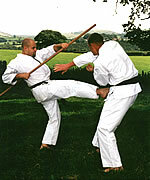 The more potent techniques and methods contained within the kata were further obscured. The birth of competition and of the grading system eventually resulted in many practitioners being more concerned with the "look" of the kata in order to win trophies and pass exams. Competitive sparring also resulted in karate beginning to focus on the defeat of other karateka in competition, as opposed to the defeat of a violent and untrained attacker in actual combat. I would again caution the reader against viewing these changes in a negative light. Certainly they had a negative effect on the effectiveness of the way karate was practised, but they also ensured the survival and spread of karate. If these changes had not been made it is extremely unlikely that karate would ever have left Okinawa, if it survived at all! These changes ensured the survival of karate, and the kata associated with it. The kata contain all the principles and methods of the original fighting art, and if we wish to practice the original karate all we need to do is alter the way we approach the kata. In conclusion, the kata are a collection of highly effective fighting techniques and concepts that have been developed and refined after exposure to many systems. The kata were closely guarded secrets that would only be taught to the most trusted individuals and the unique culture upon the island of Okinawa created an ideal situation in which effective empty handed fighting skills could develop. But various historical events - which were vital for the survival and spread of karate - have resulted in the combative applications of the kata being obscured. It is hoped that after reading this article you are more aware of the evolution of kata and some of the issues associated with understanding their applications. Thanks for taking the time to read this article. I hope you found it useful.